With the Sun and Moon both in Sagittarius (NEW MOON !!! ), today and tomorrow are Days of ‘The Fool’. Wide-eyed and bushy-tailed, The Fool is about to jump off a cliff. The Fool isn’t a fool in the ordinary sense. Indeed, he represents the most enlightened energy in the deck. He’s the archetypal youngest son in fairy tales in whom initially, no one had faith. And so our young man set outs with nothing and returns having conquered the world. Not only has he recovered the lost treasure, married the pretty princess, and fathered a stable of beautiful children, but he also has the fidelity to return home to share his gain. While his older brothers, in whom their father had placed his promise, the Fool is bright and sunny for he alone has succeeded big time. Unlike those brothers, the Fool didn’t over analyse. Nor did he try to be cute or clever. He didn’t even try to rely on patronage and family connections. He just went out there and by sheer force of character ‘did’. 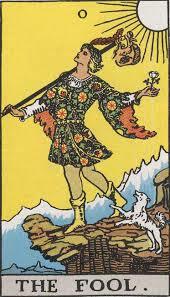 The Fool is the real hero of the tarot. That’s why you’ll often find him both at the beginning and the end of the (Major Aracana) deck. He started out modest and simple and despite his ‘wins’, he returns the same way. This doesn’t mean he hasn’t grown. On the contrary, it suggests he’s perfected his self par excellence. For despite all the heart ache and disappointment he’s experienced during his travels, The Fool refuses to let any of it get him down. He’s just as adventurous, curious, and cheerful when he returns as when he first left. That’s not easy, as I’m sure you know because most of us have let our trials and tribulations get the better of us – to the point in which some of us no longer even try. Days of ‘The Fool’ offer a unique opportunity to put the past behind you and start all over again. Remember what it felt like when you first set out to conquer life? I bet you can do it again. That’s a Timelord with K=9 about to step into his Tardis, grateful that he can finally take that silly frock off!! I quite like that interpretation -thanks !